Why hire an S Type-Jaguar? This spacious classic sports saloon could best be described as an upmarket Jaguar MK 2, offering a super combination of looks, performance and comfort. With a Jaguar S-Type hire you are hiring the perfect sports car, town car and cruiser all rolled into one. In 1960’s TV and film the Jaguar S-Type was the car used by the baddies. 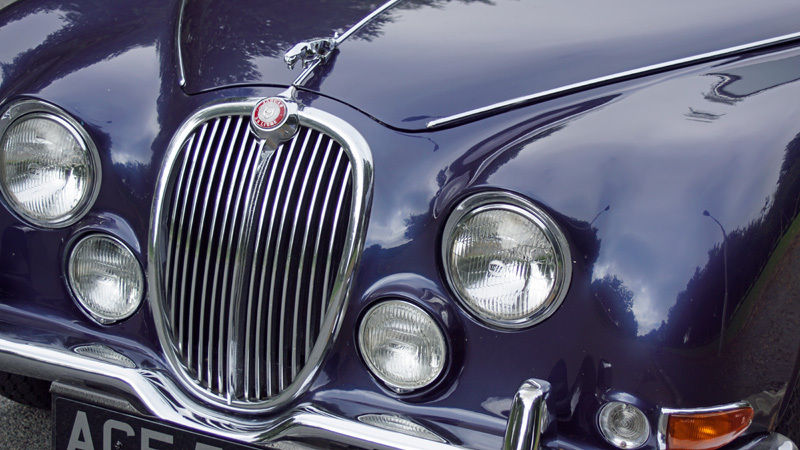 So whether you want to attend an event in style, cruise down the motorway, or dream of the infamous chase scenes in the Sweeney, a Yorkshire Jaguar S-Type hire is the perfect choice. And it’s roomy enough to take your family or friends with you. 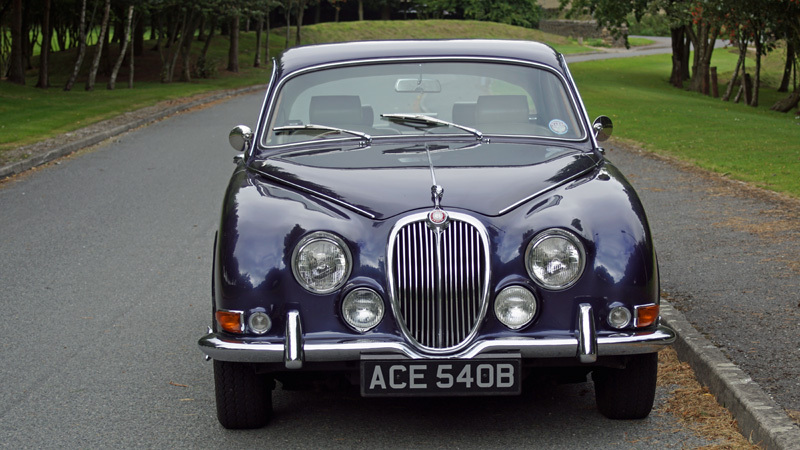 Smooth and comfortable, our striking 1960’s dark blue S-Type also makes a luxury self-drive Jaguar wedding car. The generous interior is sumptuously fitted in pale grey leather upholstery with walnut trim. Make your big entrance with style and panache! 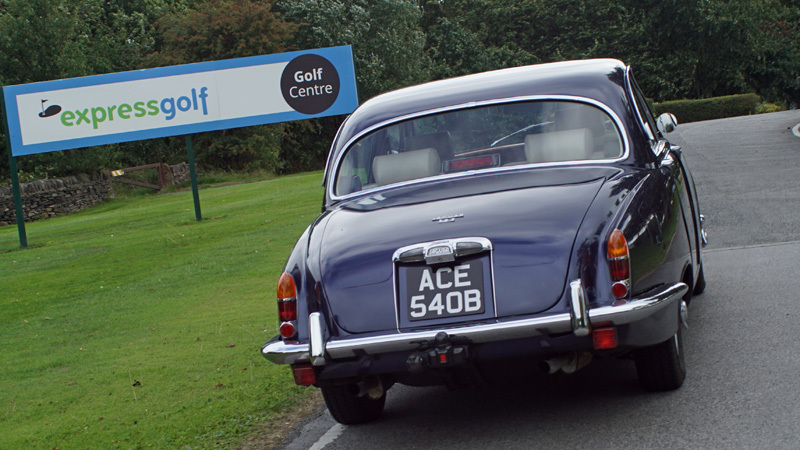 Our 1964 Jaguar S-Type hire car is a 4 door 4 seater saloon. In terms of body styling the S-Type looks very similar to it’s perhaps more famous stablemate, the MK 2. Finished in metallic French Blue, and with much the same rounded front, it is embellished with lots of chrome including wire wheels, fog lamps and the leaping cat mascot. However, with extended rear end styling and upgraded interior, the S-Type was designed not only for visual appeal and performance but also for space, luxury and comfort. 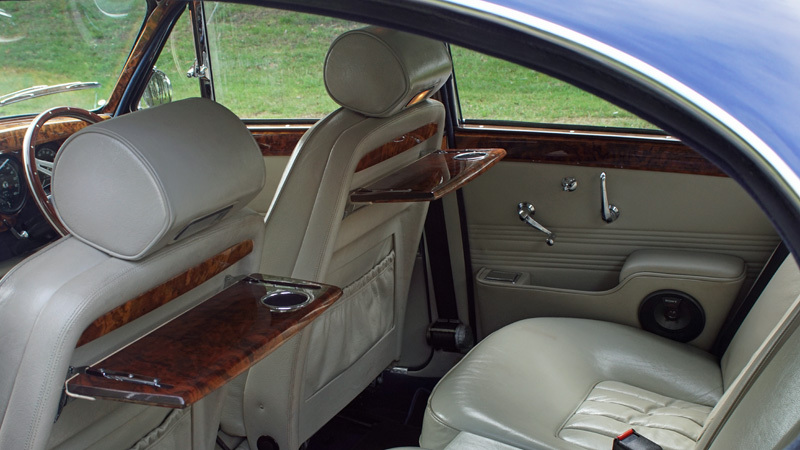 The interior is roomy, with quality pale grey leather and lavish amounts of walnut trim. The front seats are operated electronically and the rather splendid dashboard has a comprehensive range of dials and switches. A radio and a full width parcel tray sits beneath the instrument panel. A CD player has been fitted and there are even picnic trays for the rear passengers on the back of the front seats. The boot is wide and long, with ample space for luggage. Under the sensuously curved bonnet sits the acclaimed 3.8-litre XK engine. This legendary engine powered some of the most evocative cars of the last century. It was fitted not only to the Mk 2 and MK X but also the XK150, earlier Jaguar E-Types, the XJS, XJ6 and more. Our S-Type has a 4-speed manual gearbox box with overdrive and power steering. It also benefits from independent rear suspension for improved road-holding and ride quality. Whilst the car was once owned by a pilot, it’s just a coincidence that the number plate begins ACE…! In the early 1960s Jaguar identified the need to develop a car which combined the best of the sporty MK 2 and of the luxurious, but massive MK X, and the S-Type was born. 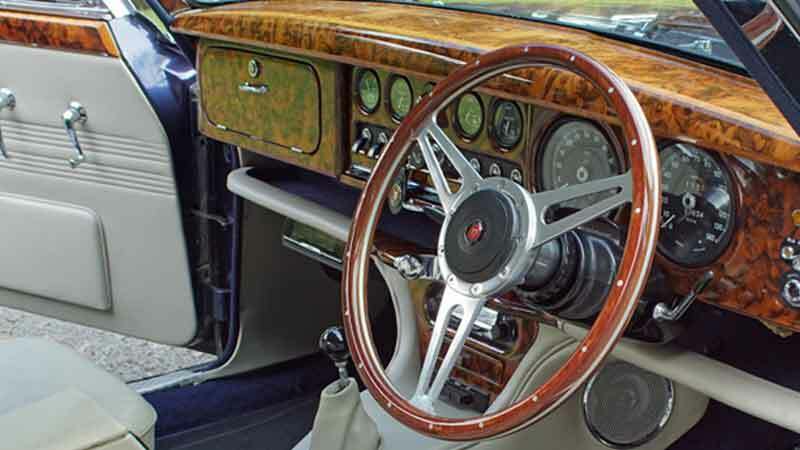 To achieve this Jaguar styled the S-Type’s interior in the sumptuous style of the MK X, and remodelled the exterior at the rear to give more passenger and boot space. 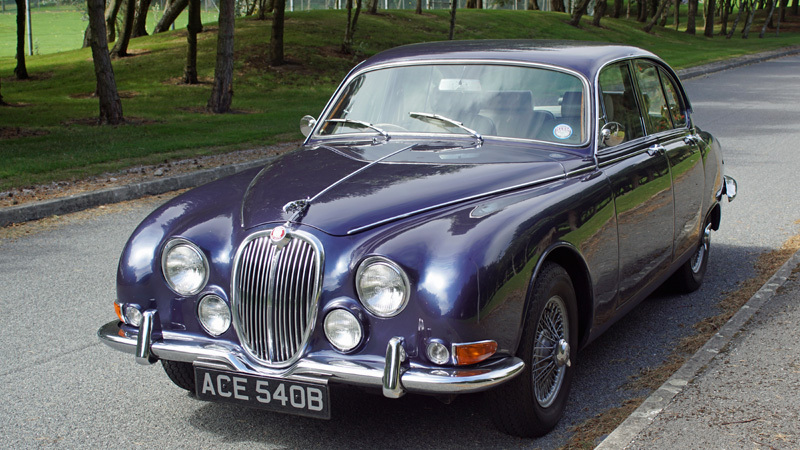 The Jaguar S-Type came onto the scene in September 1963 and was produced until 1968. Almost 25,000 came off the assembly line. The front of the car remained very much the same as the MK 2, with some very minor changes which included the position of the indicators. Engine choices were the familiar 3.4-litre and 3.8-litre XK engine. 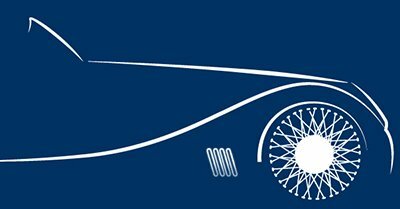 Jaguar’s acclaimed independent rear suspension (as fitted to the E-Type) was added, for better ride quality. You may remember the S-Type if you’ve ever watched the Sweeney. The Police drove Fords and the villains drove Jaguars. The world was simpler in those days! The exception is one episode called ‘Stoppo Driver’. In this the bad guys blackmail a policeman into driving their getaway car – a Jaguar S-Type – by kidnapping his wife. In real life the S-Type was used by the London Metropolitan as a squad car. Contact us for a Jaguar S-Type hire from our Leeds base in West Yorkshire.